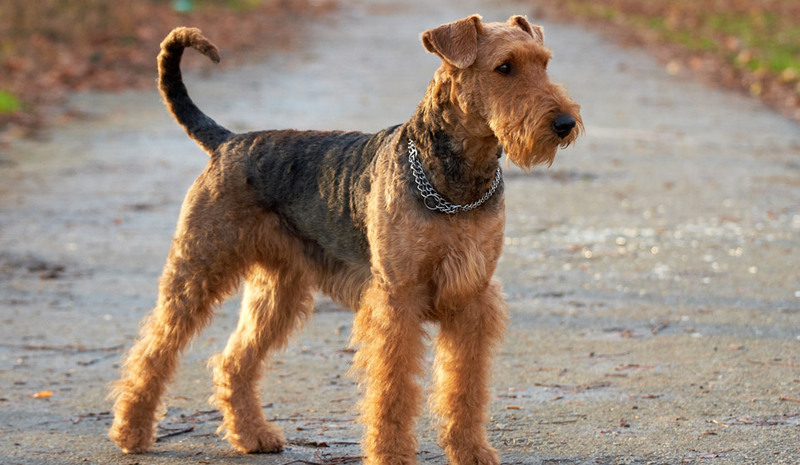 The Airedale Terrier (also known as Waterside Terrier) originated in 19thcentury Yorkshire, England and were originally bred for hunting otters. They were created by crossingthe old English rough-coated black and tan Terrier with the Otterhound. These dogs are great workers and were used for a number of tasks during World War 1 including messengers, carriers of goods, sled and guard dogs. Today they are often used for police or military work however, they are also popular pets. The largest of all terriers, they have a dense wiry coat which is mostly black and tan, with occasional white hairs. This requires regular brushing and clipping. Due to their outgoing, non-aggressive and friendly nature and athletic build they are suitable pets for active people and families. These dogs are highly active and intelligent and need daily physical exercise as well as mental stimulation to prevent behavioural problems. Average lifespan is 13 -15 years. Hip Dysplasia – Abnormal formation of the hip joints causing early onset degenerative joint disease. Entropion – Excess eyelid tissue causing the eyelashes to turn inward and rub against the surface of the eye resulting in corneal ulceration. Corneal Dystropy – Age related change resulting in inflammation of the cornea and possible corneal ulceration. Hypothyroidism – Underactive thyroid gland causing obesity, lethargy, ear infections and skin problems. Pulmonic Stenosis – Narrowing of the pulmonary artery resulting in reduced flow of blood to the lungs and eventual heart failure. Von Willebrand’s Disease – Blood clotting disorder. Retinal Dysplasia – Congenital failure of the retina to develop correctly can cause poor vision. Looking for Airedale Terrier insurance?